Posted: June 12, 2015 in Features, Who,What,Where & When...? 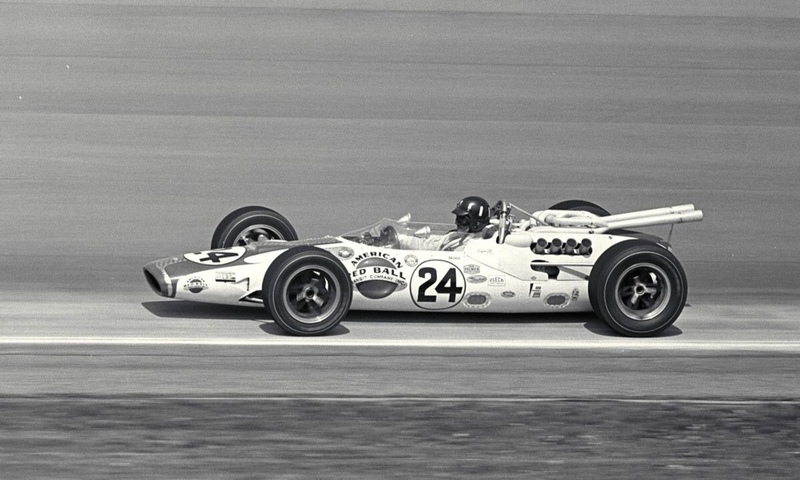 Hill won the race from Clark and Jim McElreath’s Brabham. 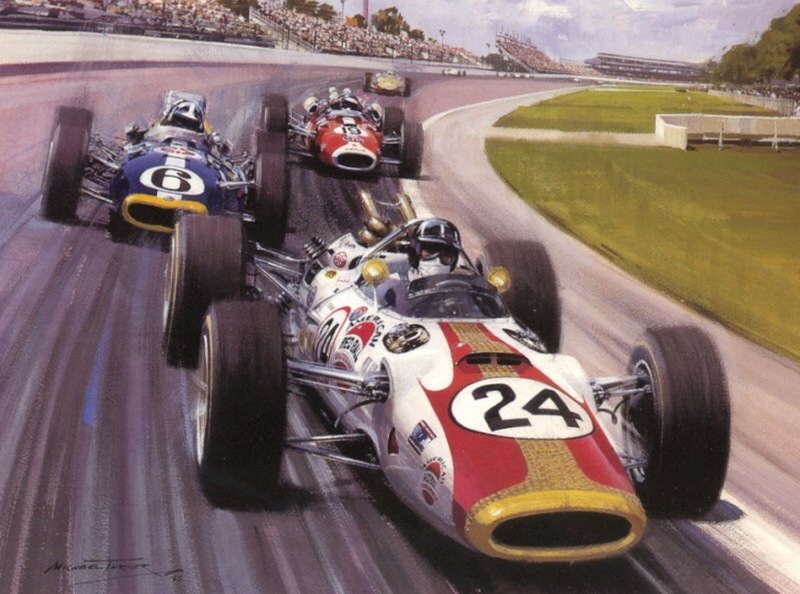 Graham lead the most critical part of the race, it’s last 10 laps after teammate Jackie Stewart slowed and retired his Lola T90, the BRM teammates also ‘roomies’ and Indy debutants in John Mecom’s Indy Team. The race was not without controversy with more than one lap timer giving victory to Clark, who spun twice during the race without hitting anything on each occasion but causing some lap scoring confusion. 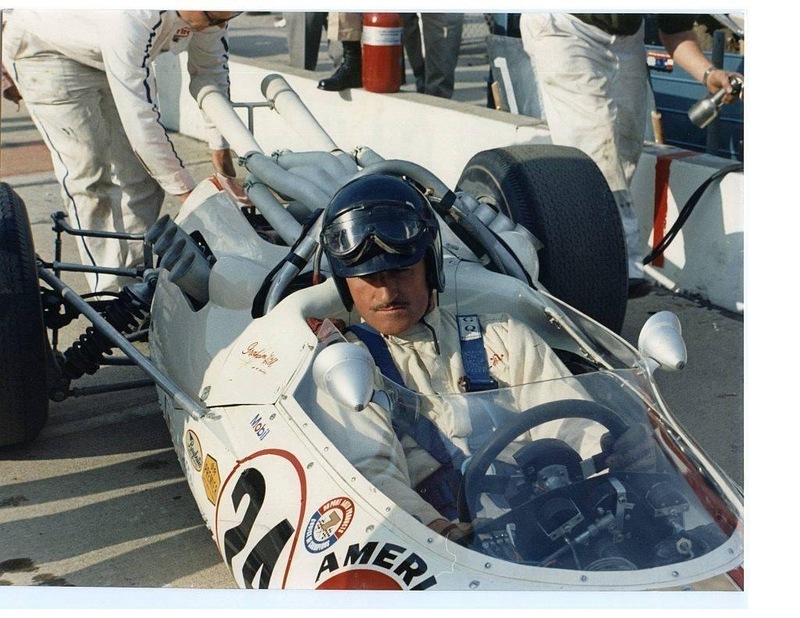 Hill was doubly lucky; he was not entered to race until the unfortunate Walt Hansgen was killed in the LeMans test weekend in a Ford MkII, the Brit taking the unfortunate Hansgen’s place in Mecom’s factory Lola entry, Mecom the American Lola importer at the time. 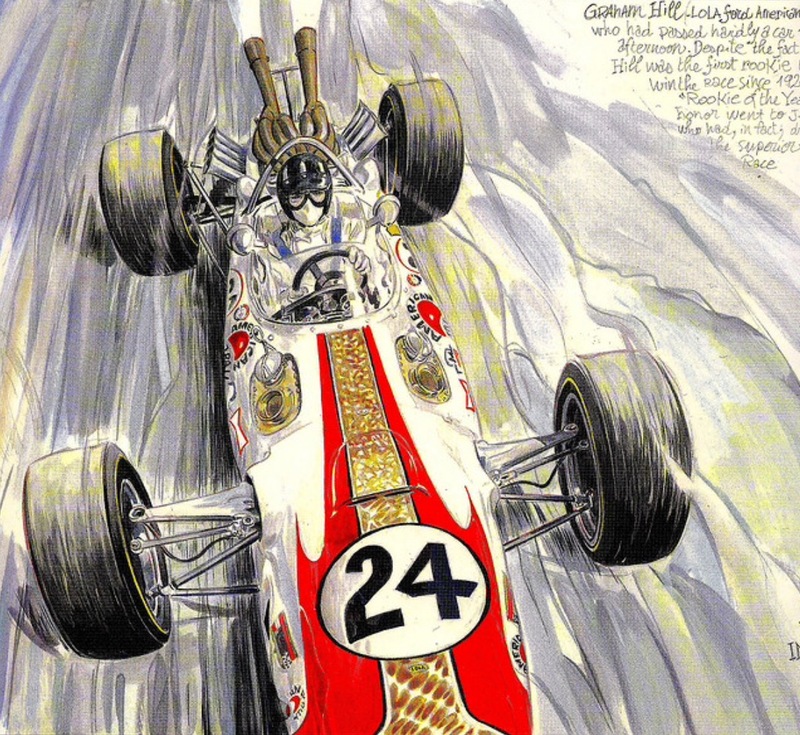 One of my earliest motor racing memories is of Hill’s car, the Lola featured big time in one of those ‘Boys Own’ type books we were all given as stocking fillers at Christmas. I have always had a soft spot for these big Lolas’ as a consequence. I still have the book but its in storage, i can’t remember what happened yesterday but the book’s articles on Hill’s Lola, the equally new curvaceous Lola T70 and Tony Lanfranchi’s psychedelic helmet livery i adopted as my own in 1979 stick in my mind. Come to think of it my Lola fetish started then! 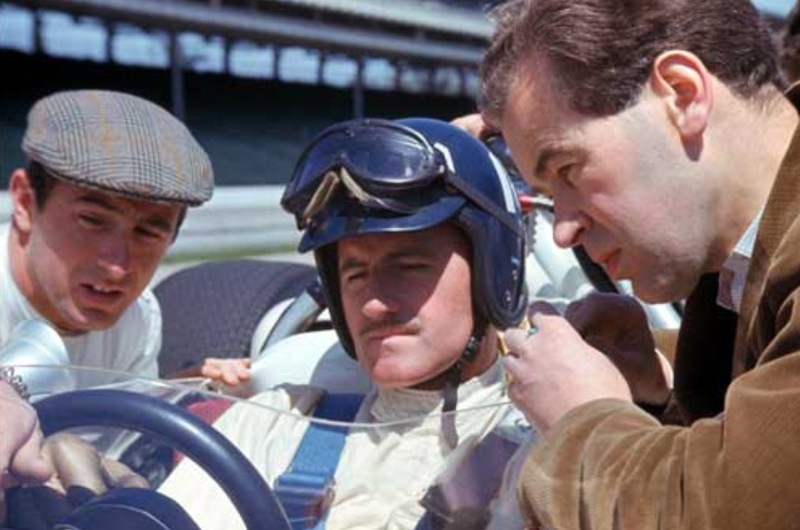 The mid-engined invasion of Indianapolis was started by Cooper, Brabham raced at Indy in 1961, Lotus had their first start with the pushrod-V8 Ford powered 29’s driven by Clark and Dan Gurney in 1963. 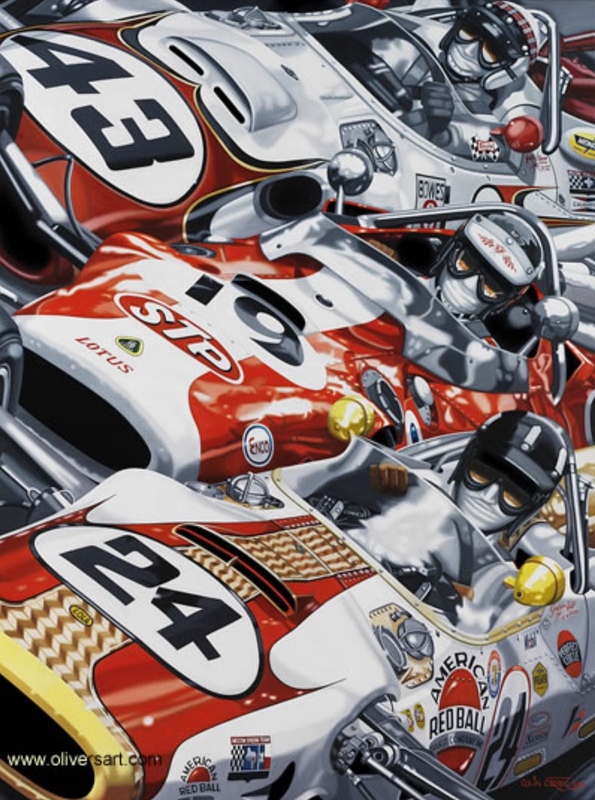 Ferguson and Lola joined the stampede with mid-engined victory finally achieved by Team Lotus in 1965. Clark victorious in the Ford four-cam 4.2 litre V8 engined Lotus 38. 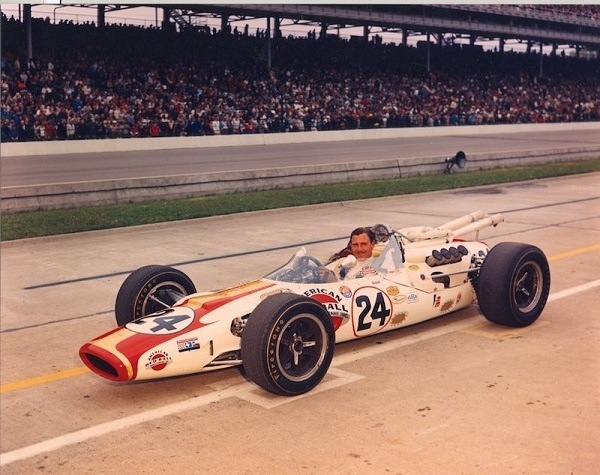 The US was a big market for Lola’s Eric Broadley, he achieved much success with the Group 7/CanAm T70 from 1965, USAC was another great opportunity. 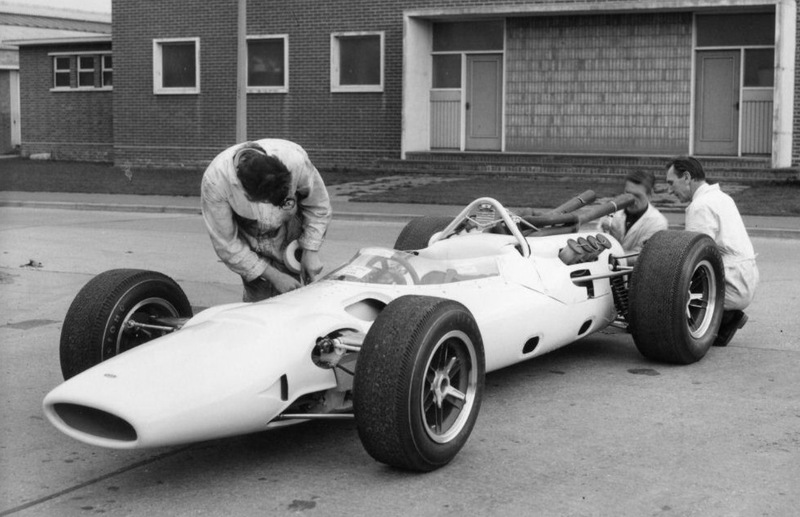 Broadley built the T80 for Indy 1965, but the car was late, wasn’t tested and was let down by suspension geometry shortcomings which gave the cars poor and unpredictable handling. 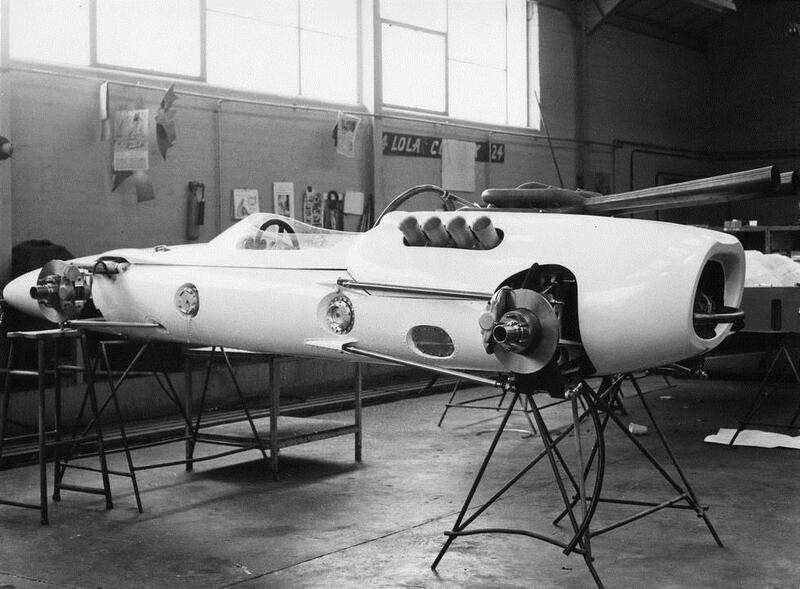 The T90 chassis was an aluminium monocoque constructed from Indy mandated 16-guage aluminium. Sheet steel diaphragms front and rear provided additional internal stiffness, externally a sloping scuttle in front of the instrument panel gave additional rigidity. Lola Heritage ‘Tubular steel subframes were attached to both the front and rear of the chassis, the front subframe carrying the oil tank, radiator and the forward mountings for the lower wishbone. At the rear there were two subframes above and below the two-speed Hewland gearbox, the upper one carrying the attachment point for the single top link and the top spring/damper mounting. 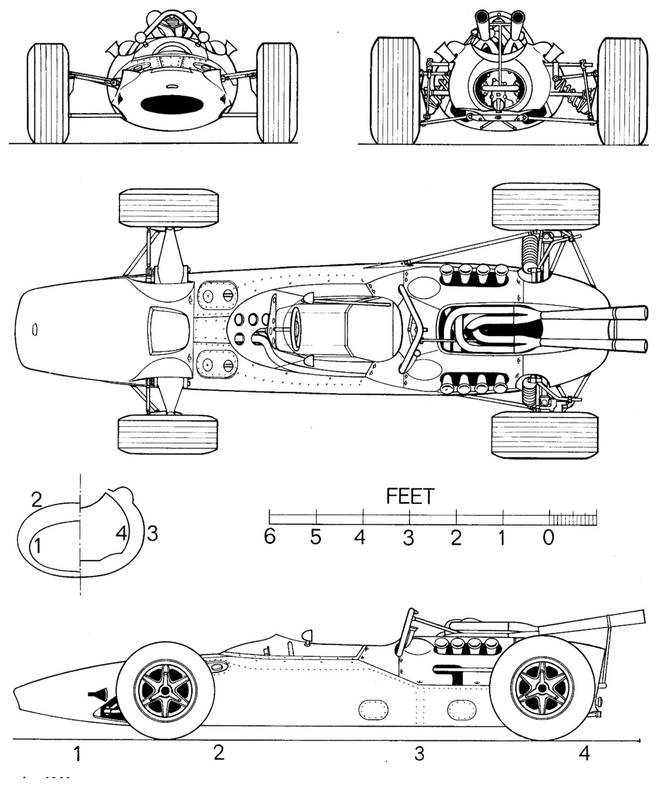 The lower subframe had the mounting points for the lower wishbones’. 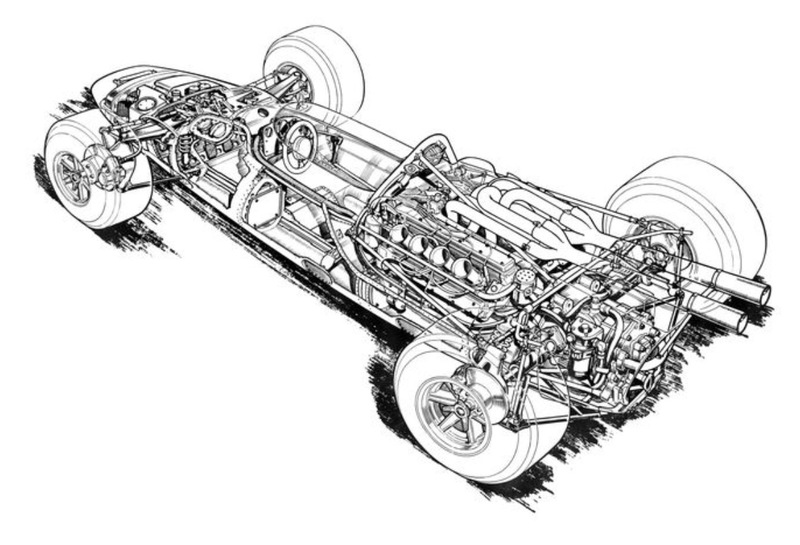 The cars front suspension was inboard with fabricated rocker arms at the top operating coil spring/damper units and wide-based lower wishbones. 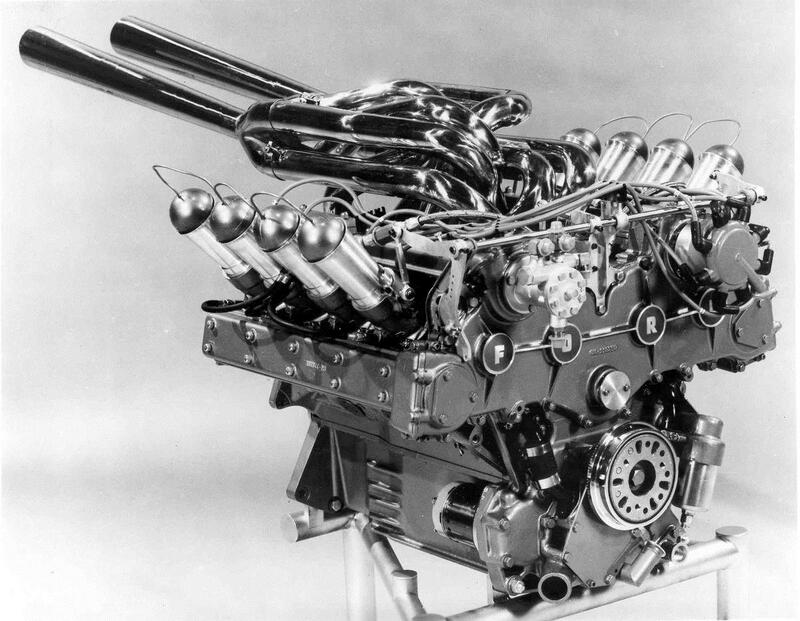 Ford’s 1963 Indy engine fitted to the Clark and Gurney Lotus 29’s was an aluminium variant of its 260cid Falcon/Fairlane small block V8, it developed 350-376 bhp at 7200 rpm on 103 octane fuel fed by 4 Weber 58mm carbs. 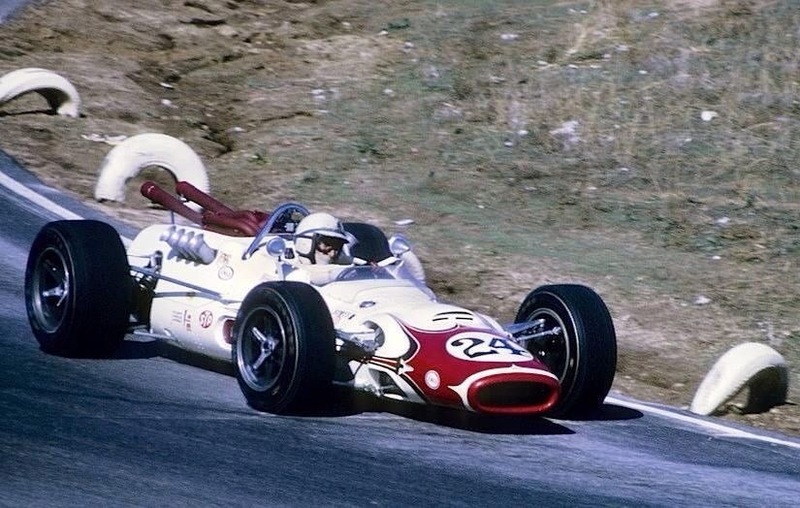 Ford, after Lotus’ great showing (they was robbed) in 1963 decided to build an engine capable of developing 50bhp more but with a weight gain of no more than 50 lbs over the aluminium pushrod engines 345lbs. Ford evolved, using many parts from the earlier engine, a DOHC motor with four valve heads, the combustion chamber ‘pent roofed’. The engine had ‘between the Vee’ exhaust as tests showed power was optimised with this setup. Hilborn fuel injection was used, in 1965 the engines developed 425bhp @ 8000rpm. The block was cast of aluminum alloy using patterns modified from the production 289cid production ‘small block’. Cast iron cylinder sleeves were a shrink fit in the block and were sealed at the heads with copper laminated steel O-rings. In order to clear the two banks of camshafts in the heads, the 10 attaching studs were moved closer to the cylinder centerline. An additional 8 studs protruded from the heads maintained clamping force needed to seal the combustion chambers. The space occupied by the camshaft in the normal production engine was replaced with an oil tube. This acted as a gutter and collected oil as it drained from above to keep it off the reciprocating assembly. The bottom end was beefed up considerably. The special forged steel crankshaft was held by 4-bolt bearing caps on numbers 1 through 4. Main and rod bearing journals are the same size as the 289, as is the engine’s stroke – 2.87″. The rod journals are crossdrilled for better oiling at high engine speeds. The rods are from the 289 HiPo, modified for floating pistons pins. The pins are 289 HiPo pieces. The oil pan is cast magnesium and is a structural part of the engine. ‘Ears’ cast integrally with the pan provide the engine/chassis mounts. As summarised above, the cam-ground forged aluminum pistons have a pent-roof dome to closely fit the combustion chambers. Compression is 12.5:1. The cylinder heads housed 4 valves per cylinder with a central spark plug. The plugs are canted toward the 1.64″ diameter intake valves. Exhaust valves are 1.36″ diameter. The camshafts run in bearing bores in the cylinder heads directly over their valve banks. Valve clearance is adjusted by the selective fitting of the followers. Intake ports are between the cams with exhaust out the top of the heads between the vee. This was done to do away with the nightmare of exhaust tubing normally required. Hilborn injection is used having been selected for its light weight and simple low-pressure design. Once developed by Ford the engine was sold and serviced via Louis Meyer. In 1966 Ford built 20 engines which retailed at US$23000. 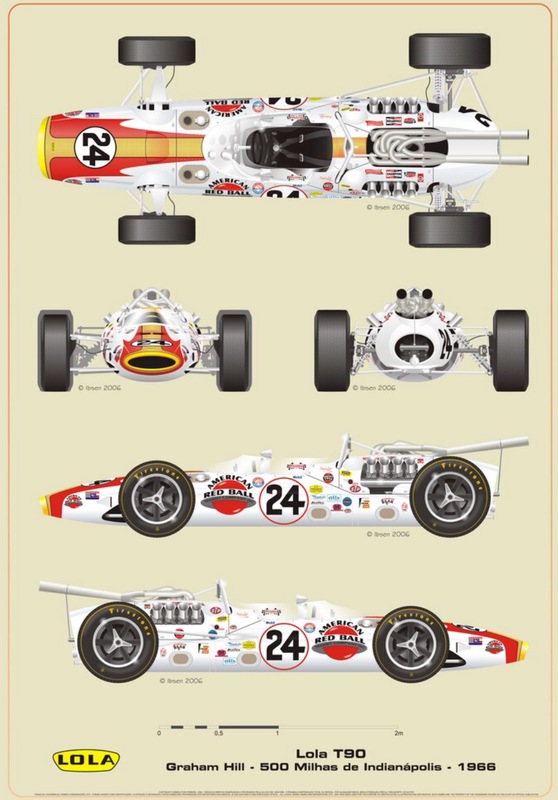 The wonderful engines evolved over the decades, in both normally aspirated and turbo-charged form as Indy rules changed. 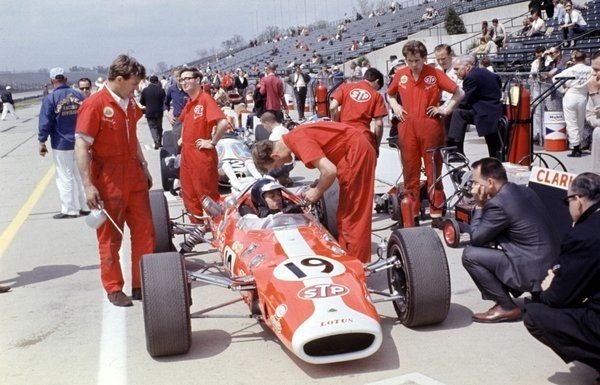 Lola Heritage ‘Learning the lesson from 1965 Lola made sure the T90 was ready in plenty of time for the 1966 Indy 500, the John Mecom Racing Team-entered car made it’s debut at the March season opener at Phoenix International Raceway. 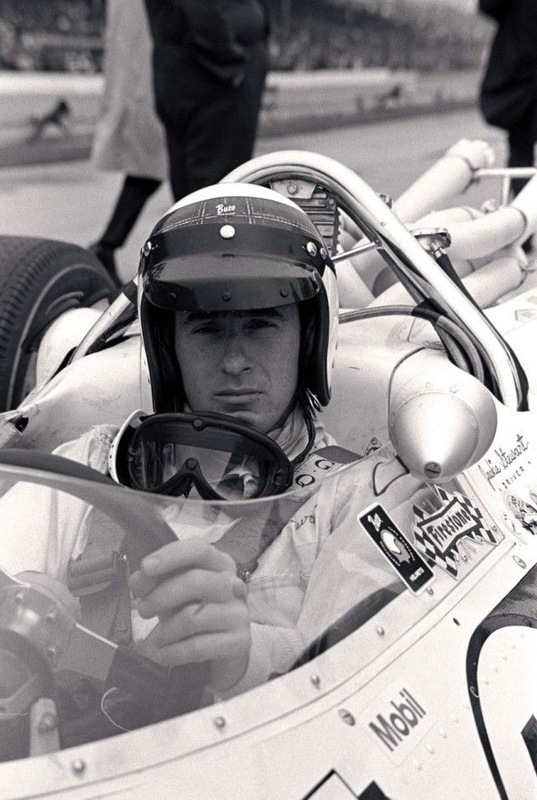 Success was immediate with Roger Ward finishing second in his Offenhauser-powered T90 and a month later Ward took the winner’s laurels at Trenton’s 1-mile paved oval when he won a rain-shortened race ahead of Gordon Johncock. 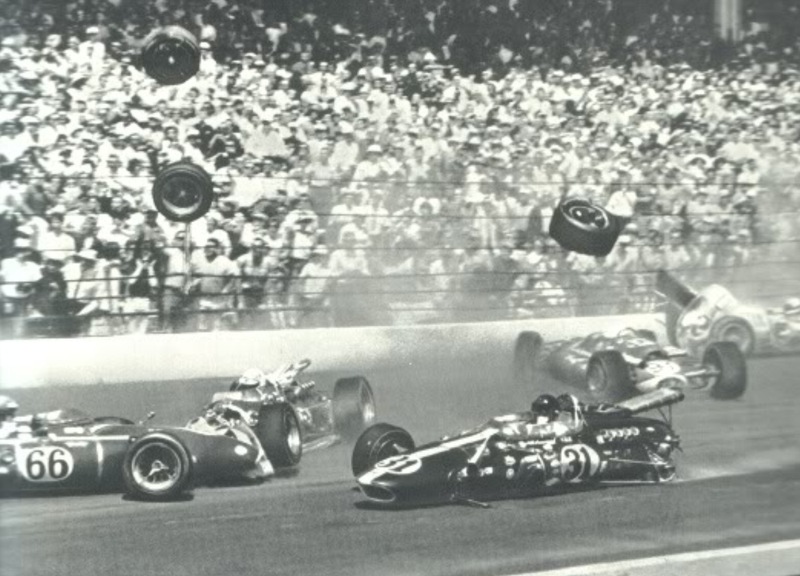 The Indianapolis Star called the 1966 Indy 500 ‘the most fantastic, confused and incredible 500.’ And it may have been. This was the ‘500’ marked by a 16-car crash at the start when Billy Foster’s car hit the rear of Gordon Johncock’s Gerhardt setting off a violent chain reaction that eliminated 11 cars, including those of A.J. Foyt, Dan Gurney, Don Branson and Cale Yarborough. 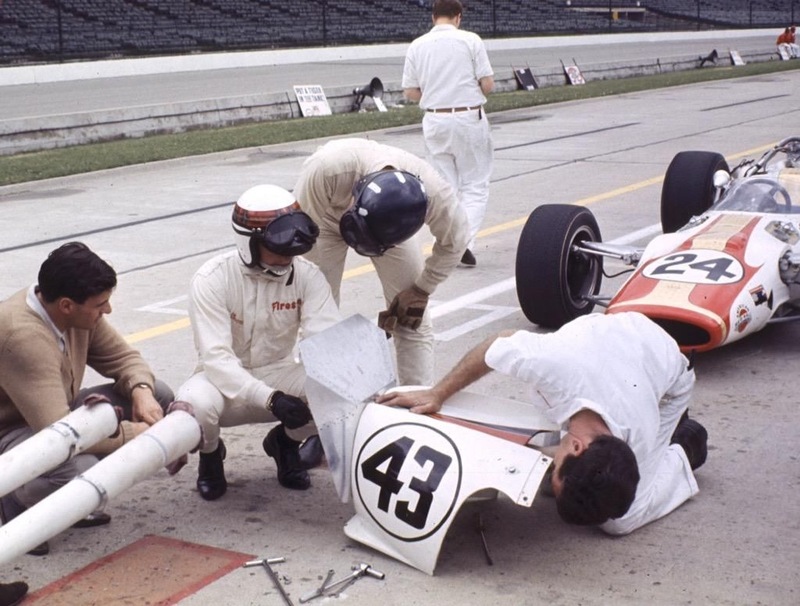 Foyt suffered minor injuries, a cut finger and a bruised knee when he climbed out of his car and scaled a fence to get away from the scene. The race was red-flagged for the second time in three years and was re-started after a one hour and 23 minute delay. 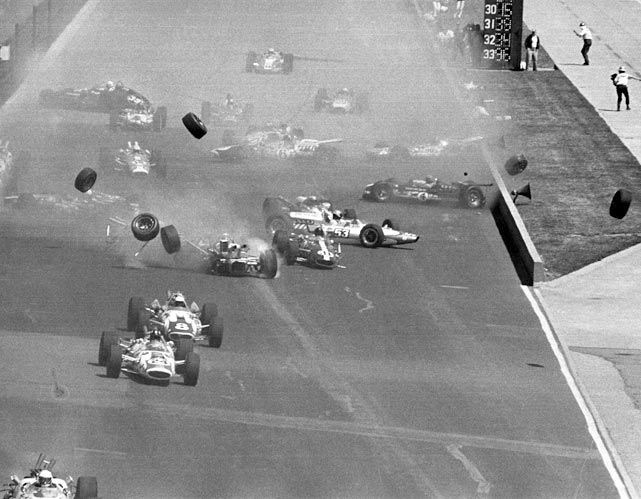 Mario Andretti took the lead at the restart but retired shortly thereafter with engine failure. Clark lead but spun twice with handling maladies without hitting anything, pitting on each occasion to have the car checked. Stewart and Lloyd Ruby in an Eagle diced for the lead before fuel stops put Clark back in the lead. Ruby took the lead but his car was then black-flagged for the loss of oil, leaving Stewart in the lead from Clark and Hill. Hill had progressed through the field without making mistakes and benefiting from others errors or misfortunes, by lap 175 he was past Clark for 2nd. Stewart lead, until with 25 miles to go his oil pressure diminished, his engine scavenge pump failure gave Hill the lead he was not to relinquish. Despite protests by Lotus’ Colin Chapman and sponsor Andy (STP) Granatelli that Hill had been incorrectly scored with an extra lap, the unofficial results stood. 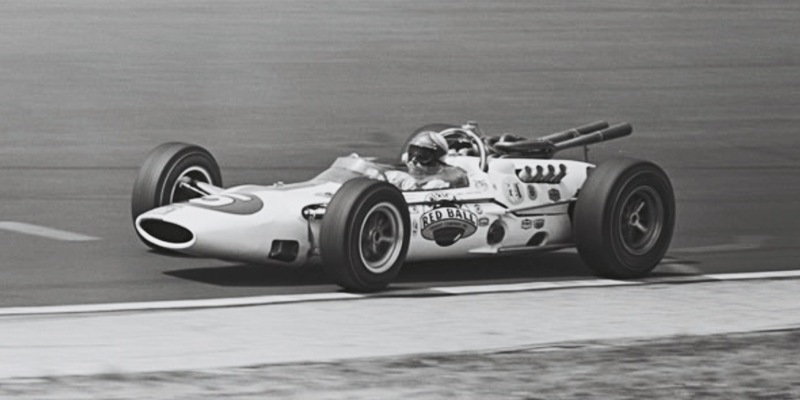 Hill won $156,297 for his victory, Jim Clark finished second battling an ill-handling car the entire race, Jim McElreath’s Brabham Ford was third and Stewart was classified 6th. 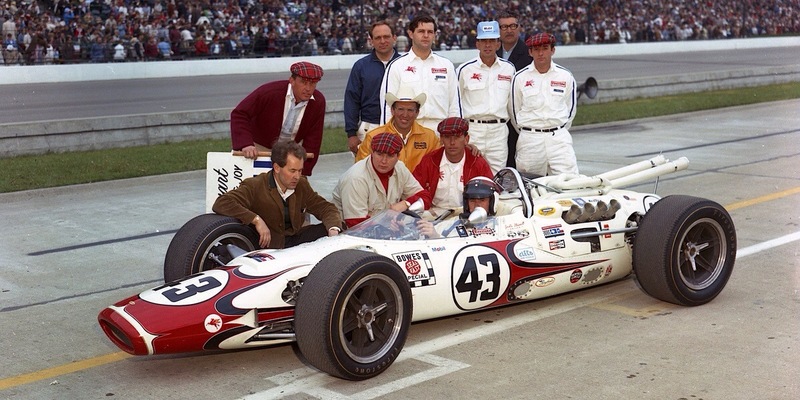 In the Jackie Stewart #43 photo Mecom is misidentified as in the Texas hat. 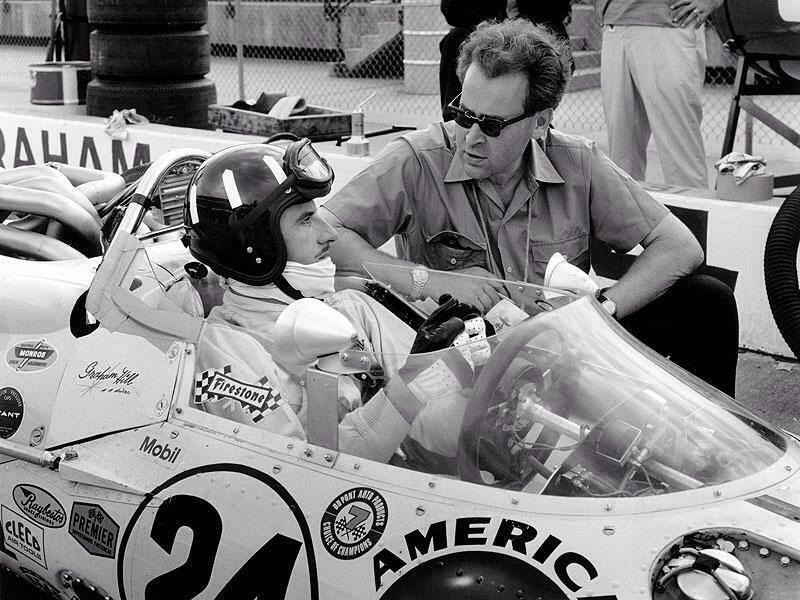 That is actually George Bignotti the chief mechanic. Mecom is below Bignotti in the tan shirt. I own the #43 car. Thanks Patrick for getting in touch, you are a lucky boy, a wonderful car to own. I have changed the caption accordingly. Is the car complete and raced or demonstrated? That’s an old one I had forgotten about! I’ve added Ibsen’s name to the post and the name in full to the list of credits.